Visual Studio Code>Debuggers>Daddy-JestNew to Visual Studio Code? Get it now. Daddy-Jest is an extension for Visual Studio Code for debugging Jest tests. This extension allows you to run individual tests in the debugger with multiple test configuration files..
Daddy-Jest is an extension for Visual Studio Code for debugging Jest tests. It allows you to run individual tests in the debugger. To do this the Jest configuration must be placed in 'package.json' or in a separate config file. This is the first version so it has only basic features that I couldn't find in other extensions. Daddy-Jest, unlike other extensions, allows you to specify several test suites with different configuration files - the correct configuration is determined automatically at the time the test is run. At the moment it doesn't seem to be possible to show the context menu option dynamically that's why Jest debug command is always present even if you call the menu outside the context of the test. The extension has been built and tested in VSCode 1.32.3, Node.js: 10.2.0, Windows_NT x64. When encounter bugs please post them in GitHub repository issues. "daddy-jest.jestPath": It's Jest library directory path. Practically you don't need to specify it explicitly here, except when it is installed in a non-standard directory. "daddy-jest.jestConfigPath": It's a path to Jest config file, most often it's a part of the 'package.json' file and you don't need to specify it here, but in some cases you may want to keep it separatly and therefore you'll need to fill in this parameter. Remark: even having multiple configs you can still keep one of the in the "package.json" and you don't need to add a path to it. The first two options can filled in via Settings graphical interface whereas jestConfigPaths can be only defined via JSON format in the "settings.json" file. 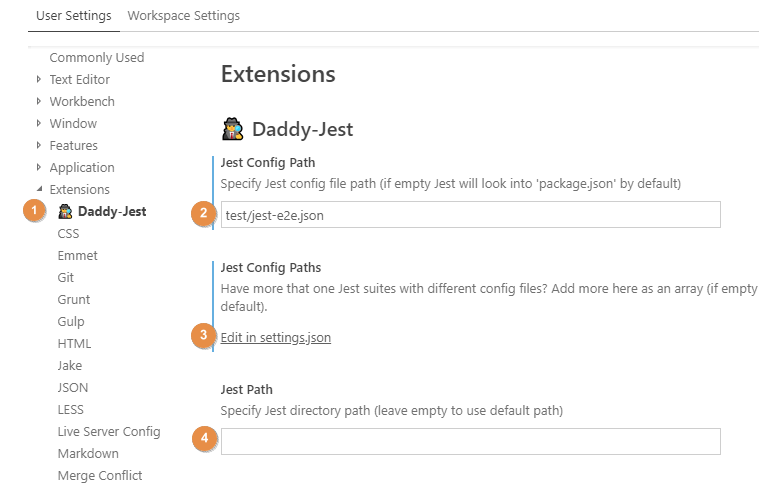 To open Daddy-Jest settings go to File -> Preferences -> Settings then in the left navigation column expand the "Extensions" item and there will be the "Daddy-Jest" item, click on it and you will see all its options available.